Hi guys, at present time most of the mobile manufacturing companies launch latest technology smartphone. These smartphone comes with latest features. Most of the smartphone users like to buy costly smartphone. But due to some reason these smartphone are damaged. In the rainy season lot of person face the problem when water goes inside the smartphone. Due to the water your smartphone will be damaged. So, today we discuss how to repair or fix water damaged smartphone. Lot of person want to go for long drive in the rainy season with his family. This rainy season fill enjoyment in our life. But electronic equipment just like watch, camera, smartphone will be damaged due to the water. Sometime your kids drop your electronic equipment’s in the water. Sometime your smartphone fall down in the swimming pool, toilet, etc. Due to which we have to face lot of problem and spend money to repair them. But there is no need to worry after reading this article your will be able to easily repair or fix water damaged smartphone. If your smartphone is in warranty period and you take your smartphone into the service center they told you that your warranty will be void. During facing that type of situation you don’t have to take these things like: If your phone is turnoff there is no need to turn on, don’t try to shake your smartphone otherwise water goes other parts, don’t try to provide any kind of heat like microwave or other things, don’t try to blow in your smartphone. You must have to take following given easy steps how to repair or fix water damaged smartphone. Most of the mobile manufacturing companies does not provide warranty, if your smartphone is damaged due to the water. So read these steps carefully…. Step 1: If you smartphone is on then immediately turnoff your smartphone. Step 2: Remove any plastic coating from your smartphone. Step 3: Remove microSD card, sim from the smartphone. Step 4: If your smartphone have removable battery then immediately remove the battery from your smartphone. Step 5: Use cotton, soft cloth or paper and try to dry all component of your smartphone. Always remember there is no need to use any kind of liquid to dry your smartphone. Step 6: If lot of water goes inside your smartphone either you have to use vacuum cleaner carefully. You can also use hairdryer to dry your smartphone component. You can put your smartphone in sunlight or put your smartphone in the air-tight rice box or tea leaf box for one or two days. Rice and tea leaf helpful to consume water and humidity from your smartphone. Step 7: If you have better hardware knowledge then remove all component of your smartphone. Now, carefully dry all hardboard components like battery, sim, back panel, hardboard, memory card, etc. with the help of vacuum cleaner or hairdryer. But always remember keep the limited temperature of your vacuum cleaner or hairdryer. Step 8: After properly dry all component once again use cotton or soft cloth to dry all component of your smartphone. Now, re-assembling all these parts. After inserting the phone battery turn on your smartphone. Now, Your phone will be working properly. But if you feel any problem then again repeat all previous steps. Otherwise you have no way to take your smartphone in mobile repair center. Note: If you want to keep safe your smartphone with water then put your smartphone in the waterproof case. You always remember these steps how to fix water damaged smartphone. I hope you like this article. After reading all these easy steps you will be able to know how to repair or fix water damaged smartphone. Kindly share your knowledge with your friends, family members and others. 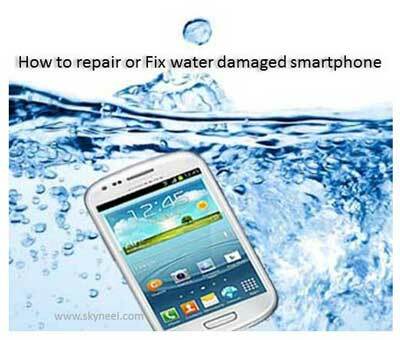 Keep safe and fix water damaged smartphone. Thanks to all.